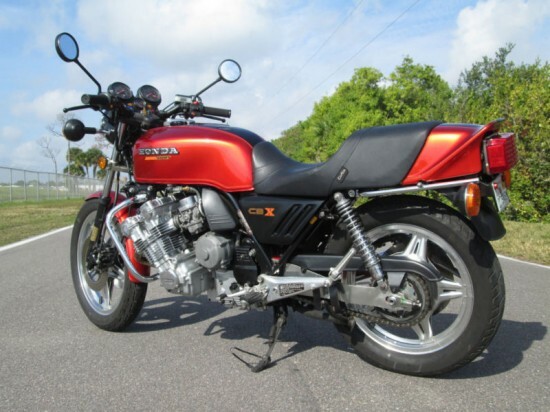 The Honda CBX is a classic example of motorcycle excess, a bike whose reason to exist seems to simply have been “because we could.” A huge, air-cooled inline six slung across the frame is an unusual powerplant, but it certainly looks good. Few bikes have bothered with this configuration, and only BMW has tried it recently: complexity and packaging issues make them pretty impractical. The CBX was introduced in 1979 and was supposedly only slightly wider than Honda’s own 750 four, although you’d never know that by looking at it. 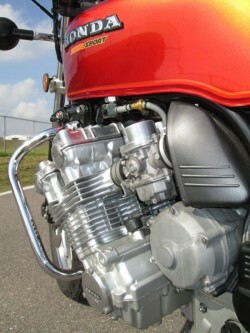 The 1047cc, 24 valve, straight six was meant to evoke the racing heritage of Honda’s six cylinder racebikes, but the machine’s nearly 600 pounds blunted any real sporting aspirations. 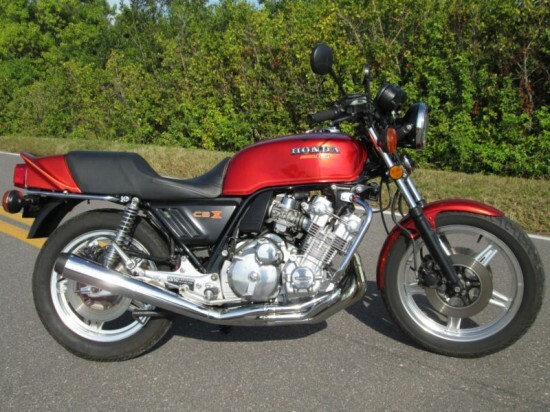 To a casual viewer, a Honda CBX looks like any other 1970’s Japanese machine. But look closer, and you notice the massively wide engine sticking out on either side and six pipes that cascade from the exhaust side of the cylinder head. It’s no canyon-carver, more of a luxury, sport-touring GT. A strong visual statement with plenty of turbine-smooth power and shrieking exhaust note that make for a very addictive ride. The bike had sat for sometime, the carbs were pretty well clogged with old ethanol gas (as most of you can imagine). So we pulled them off and gave them each a thorough cleaning – with the new carbs back on the bike and some fresh gas, she fired right up! This CBX has an absolutely incredible sound – when you crack open the throttle, she sounds like a V12 Ferrari – clean, crisp, high pitched – take a listen on the YouTube videos we have posted below and hear for yourself (… and yes, she does have the signature/normal clutch basket rattle that all ’79 CBX’s are notorious for – do a google search on CBX Clutch Basket Noise – you will be able to read all about this specific noise). She really pulls hard/strong through all gears and through the entire RPM range – she is actually way faster than we had expected (first CBX for us)! 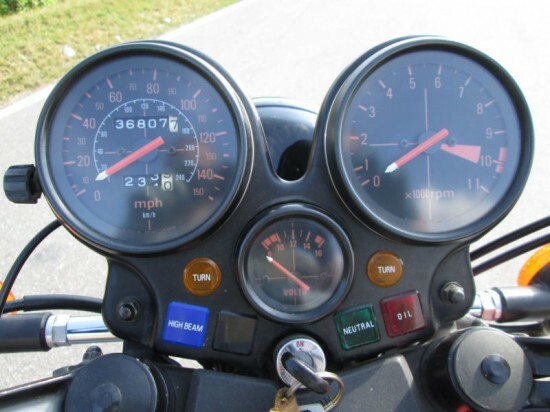 EVERYTHING on this bike works: all gauges, all lights, all indicator lights. Her brakes are awesome and she handles really well for a bike of this size. She recently won a trophy for the “Best Stock Bike” category (as chosen by the spectators) in a local car/bike show. The motor and bike are super clean – seeing her in person and giving her the once over will confirm why she took that trophy (as these photos and videos really do not do this bike justice)! While maintenance can be expensive for these, they’re reliable in typical Honda Fashion. Take care of this one and it should reward you with years of arm-stretching, stoplight-to-stoplight fun. 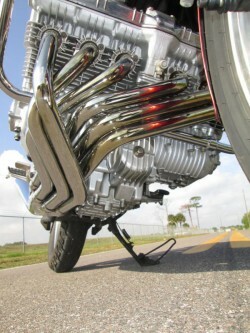 I have silver ’79 CBX. Great bikes! I think they sound more like an air-cooled Porsche six.The “whale-tail” on the seat even mimics them. Nothing like the feel (smoothness) and surge when rolling the power on.Turbine like,best describes it. Sure, plenty of modern sportbikes will leave you in the dust,but parked amongst them,nothing has more style and presence.